Calicostitch, the very first resident group of Off the Rails when it opened, is holding its end-of-year show. 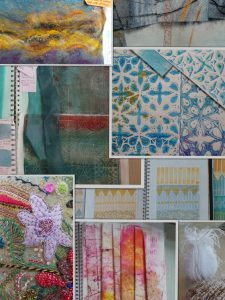 This exciting, contemporary exhibition from the City and Guilds Creative Textiles students highlights the diverse and innovative nature of their textile, design and mixed media work. Techniques used include hand stitch, felting, dyeing, block printing, quilting, lino cut printing, machine stitch, cyanotype and gelli printing. Items range from large framed pieces to small 3D items and many will be for sale.